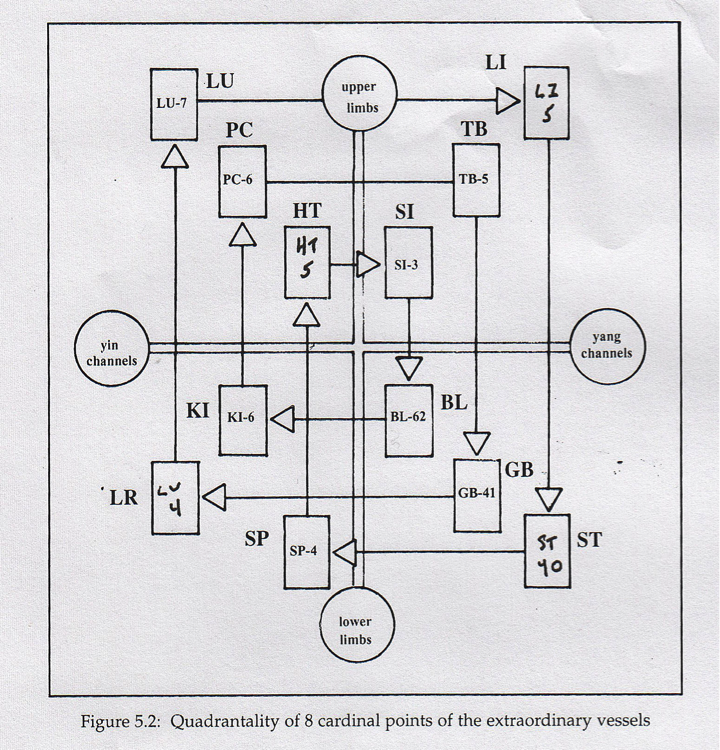 CHINESE UNDERSTANDING OF EIGHT EXTRAORDINARY CHANNELS. In the traditional Chinese approach, the 8 Extra channels are considered to be storage vessels or reservoirs of energy. They store and distribute yuan-jing, our original constitutional energy. They are considered “pre-heaven channels”, and are important in fetal development. They are not regular channels like the primary channels; they follow their own course circulation without connections to cutaneous, sinew, or channel divergences. They do not have normal yang-yin­ pairs, are not associated directly with the zang-fu, and do not have dedicated acupuncture points. However, they cross primary channel points and are controlled, influenced, and treated by primary channel points. 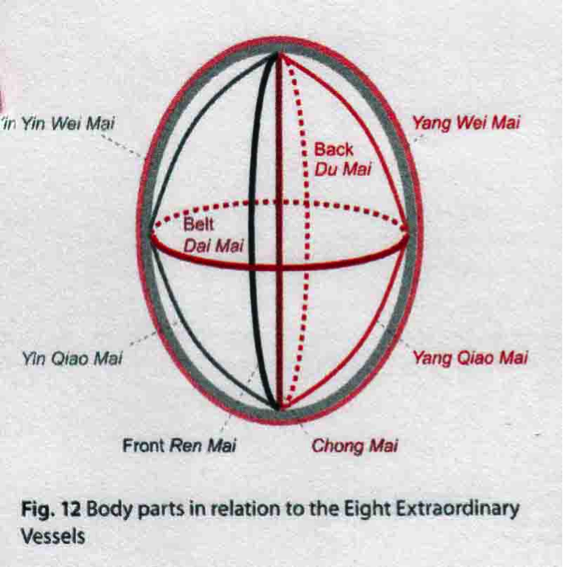 In the Chinese approach, they are seen as constitutional vessels, representing the link between pre-heaven (inherited) energies, and post-heaven (acquired) energies. Energy circulation in the Eight Extra channels help to maintain the inner equilibrium of qi, blood and distribution of jing. Part of their importance is to handle overflow and excess of qi and blood from primary channel system. In the Nanjing, the 8 Extra were described as reservoirs in case of primary channel depletion, and as reservoirs in case of primary channel excess. In this regard, they can absorb and transfer excess during blockages in the primary channel network. They do this where 8 Extra channels cross the Primary channels. Some sources believe that the 8 Extra cross the Primary channel points at the yuan-source points, allowing access to reservoirs of yuan qi from the 8 Extra network. Besides the command points, each of the eight channels connect to primary channels. In both the Chinese and Japanese approaches, these connections are often used to reinforce or develop an Eight Extra treatment, combining with a traditional Command point. This runs counter to the modern Japanese approach that we are using in the 3-Level Acupuncture Protocol, where the Divergent Channel networks runs deeper than the Eight Extraordinary Channel network, but this sequence is faithful to the classical Chinese understanding. Dr. Twicken proposes using 8 Extra therapy for problems affecting the yuan and jing, for example, chronic constitutional weaknesses leading to asthma or lung weakness, use LU 7 – KI 6. Hamid Montakab, MD, in his book Acupuncture Point and Channel Energetics (Kiener, 2014), displays 8 Extra circulation by seeing the body as a sphere. Du Mai circulates up the back, Ren Mai circulates energy down the front. Yinwei goes up the inside of the sphere; Yangwei goes down the inside of the sphere. Yinqiao goes up the outside of the sphere, and Yangqiao goes down the outside of the sphere. Chong mai goes up and down the center, and the Dai Mai links around the sphere. I incorporate this into an 8 Extra qi gong, which we will talk about in a future blog. JAPANESE UNDERSTANDING OF EIGHT EXTRAORDINARY CHANNELS. Our 3-Level Balance is a continuation of the work of Yoshio Manaka, MD, his Topological Society, and later, Miki Shima. I give an overview of this history in our Article #2. I’d like to take the opportunity to talk about more about Manaka’s understanding of the Eight Extraordinary Channels. 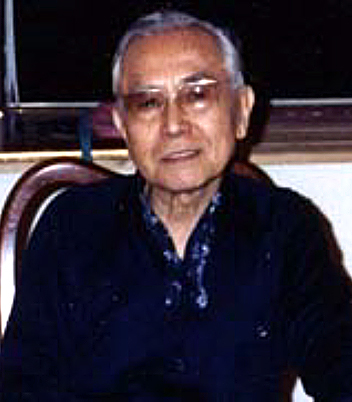 Yoshio Manaka developed an 8 Extra channel approach as a stand-alone therapy. He started by discussing the embryological role of the 8 Extra channels, allowing energy to move and develop in the fetus. Classical Chinese texts allow that the Eight Extraordinary Channels act as pathways by which qi and blood distribute in the embryo, but Manaka went further by saying that the 8 Channels were the only network in the embryo, acting as an origin for a Primary Channel system. This Primary Channel circulation emerges after birth, reaching full maturity by age 3. Manaka determined that the 8 Extra network was a simpler and more fundamental network, developing at the earliest embryologic stages. Accordingly, the manipulation of the four-quadrant body would have much deeper clinical affects then traditional Primary channel treatment. This manipulation was best accomplished through the 8 Extra pairings, using ion-pumping cords. These new “8 Extra” combinations are used in the AcuGraph Divergence menu. In its own way, it not only balances the 8 Extra network, but potentially includes all 12 channels via the Six Divisions. Manaka laid the theoretical foundation for this exciting addition to deep channel balancing by proposing these new command points. Manaka and Miki Shima both felt that manipulating the 8 Extra network first would set the 4-quadrant octahedron into balance, without driving pathogenic energies deeper into the Primary network. 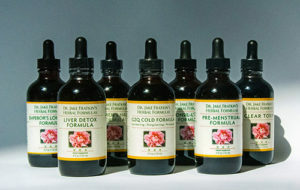 Following 8 Extra treatment with Divergent treatment, as we do in the 3-Level Balance, allows balance at the level of the primal 8 Extra network, affecting the musculoskeletal body, and then using the Divergent network to create balance between the yin-yang pairs attending to the internal zang-fu organs. After the war, he devoted himself to studying the ability of IPC to move places of excess to places of deficiency. This brought him to the field of acupuncture. He became a student of Akabane, and began examining the relationship of acupuncture channels to each other. 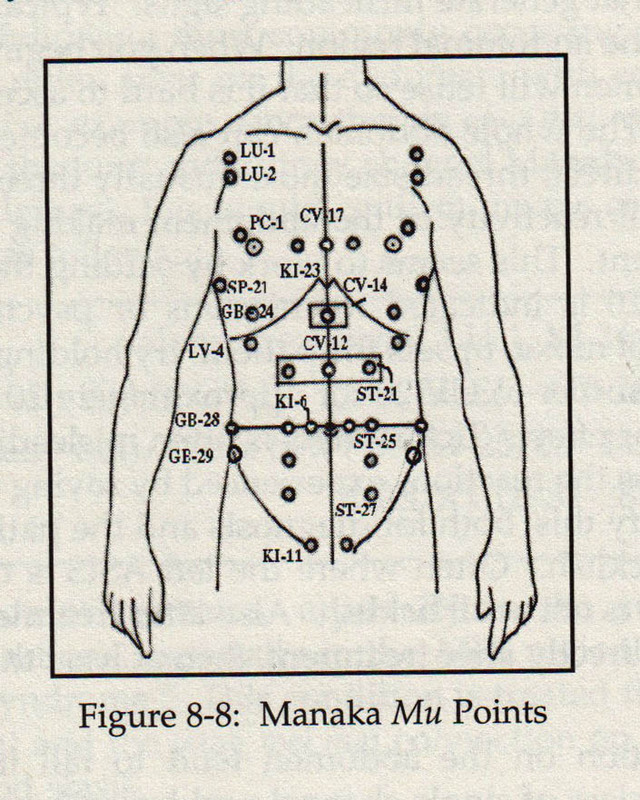 In order to confirm the actual effects of his experiments, Manaka studied, and refined, traditional Japanese palpation diagnosis on the torso. Using traditional front-mu points for the various zang-fu organs, he would look for signs of tension, flaccidity, moisture, temperature and soreness, comparing torso manifestations before and after applying some sort of intervention. These included needles, magnets, ion pumping cords, etc. A group of students gathered around Manaka’s teachings (known as the Topological Society) and would confirm Manaka’s findings by reproducing them. 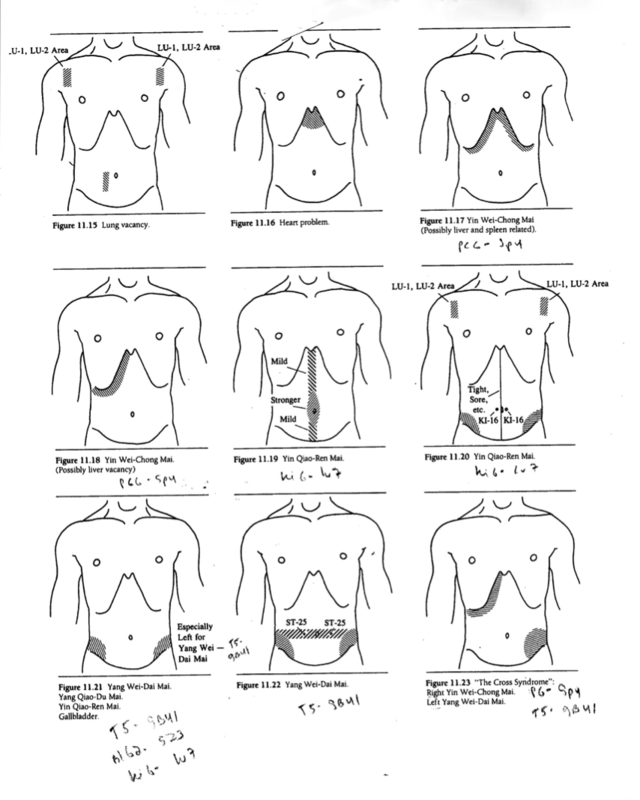 Basically, abdominal patterns of tension would change immediately with correct treatment, and the fact that various practitioners could reproduce these effects, lent evidential proof to their discoveries. Some of the Topological Society’s research included the following. 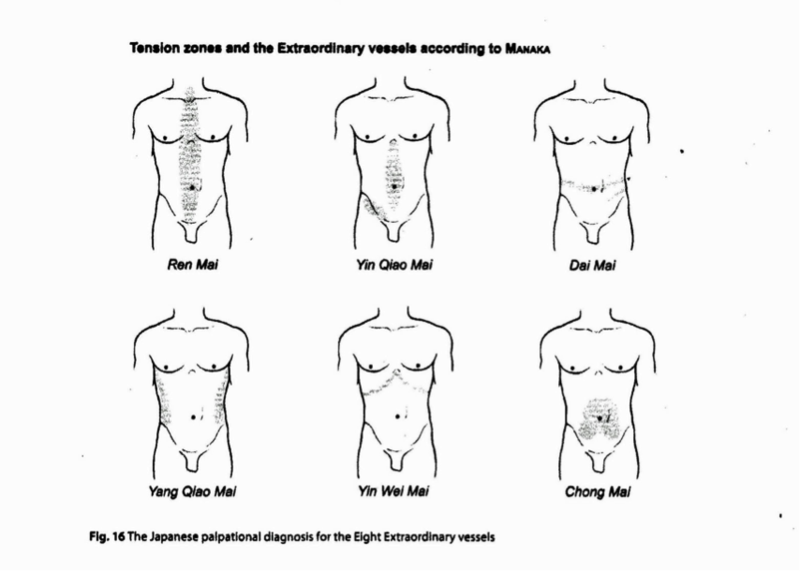 Manaka would often just treat one or two pairs of 8 Extra imbalances, based on torso palpation. He would use IPC for the master-coupled command points, but he would support the treatments with other points. Here is a list of the supportive points he would use. In conclusion, we see how Yoshio Manaka and the Topological Society explored and developed applications of 8 Extra therapy. 8 Extra can be used as a stand-alone therapy by using the first three or four point recommendations on the AcuGraph Divergence menu, and then reinforcing with additional points recommended by either the Chinese or Manaka. 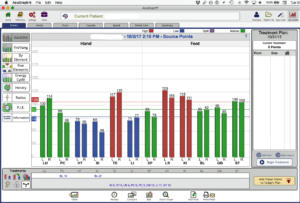 Or we can continue the balance recommended in the AcuGraph Divergence menu, continuing with the Divergence balance and integrating with the Primary channel balance, that is, allowing our 3-Level protocol. In today’s blog, we highlighted aspects around 8 Extra therapy. Manaka’s discovery of the 4-quadrant structure, dependent on the flow of the 8 Extra network, as a much more primal foundation to balance than the Primary network, is a significant development for using acupuncture to restore and enhance the body’s health. In future postings, we will talk more about the Divergence channel treatment, and also more on the Primary channel treatments.